A goregously told novel in verse written with intimacy and power, Audacity is inspired by the real-life story of Clara Lemlich, a spirited young woman who emigrated from Russia to New York at the turn of the twentieth century and fought tenaciously for equal rights. Bucking the norms of both her traditional Jewish family and societal conventions, Clara refuses to accept substandard working conditions in the factories on Manhattan's Lower East Side. For years, Clara devotes herself to the labor fight, speaking up for those who suffer in silence. In time, Clara convinces the women in the factories to strike, organize, and unionize, culminating in the famous Uprising of the 20,000. Just because I am / small boned / and short, / brown haired / and brown eyed, / just because I look / common / as a wren / meek / as a robin / that does not mean / what is inside me is also / common / as a wren / meek / as a robin. Everything / I wish for / is strange / aberrant / even wrong in this place / but I know / I cannot be the only one / blanketing her white feathers / hooding her sharp eyes / hiding / in plain sight. I may be unschooled / but I will not / be ignorant. I have never known / what kind of girl I am / not at home in this shtetl / not at home in this family / not at home in this life. But I know one thing now: / I will not be / the pheasant / quivering / hiding / from the hunter / who crashes the slender reeds / to flush out / his pray. I will never / cower / like this / again. A riveting and illuminating story of incredible courage, endurance, persistence and fighting for a better tomorrow - not only for yourself, but for everyone. This is a powerful novel written in verse. It's beautifully told and extremely compelling, but also vividly brutal and oftentimes completely heart breaking. The verse form gives this heavy and at times depressing tale surprising lightness. However, while supremely readable and - thanks to its form - quick to devour, it's also very substantial and loaded with feelings, reflections and meaning. This book taught me a lot and opened up my eyes to a world full of social injustice, hurt, pain, hunger and abuse. I knew, of course, about the horrific working conditions of the immigrants at the beginning of 19th century. I have read about the sweatshops and child workers and mercilessly shattered dreams of those who came to America hoping for a fair shot at a better life for their families and themselves. Sure, I was aware of that. But reading about this in history books and then experiencing it almost first-hand through the eyes of one of the most courageous, most remarkable, and most inspiring women in all history, well, it's two different things. I was.. I want to say stunned, speechless and moved to tears, but these words seem too weak to describe how this book made me feel. I have read this novel through tears. I couldn't help it, it spoke to me at so many different levels. I felt so sad for Clara. I cried for Isabelle and Ricco. I was enraged at Clara's father and brothers, frustrated by their ignorance, cruelty and laziness so easily excused by tradition and religion. I wanted to slap some sense into the majority of men depicted in this story. All of them so entitled, so infuriating, so much more important than women and children. At the same time, I couldn't help but respect and admire Clara's unbreakable will, dedication, determination and strength. This girl stood alone against the whole world and she won. She didn't break and she didn't bend, she did the bending, the carving and the molding. Every time the world forced her to her knees and beat her down with fists and words, she picked herself up and fought on. Her fierceness and courage inspired others and, ultimately, changed the world. She was a truly incredible person and she deserves to be remembered. Melanie Crowder's novel is an achingly beautiful and unforgettable tale about one girl who had the audacity to stand up for herself and demand equal rights. A girl who dared to dream, who didn't let the world stomp her into the ground. I can't tell you how much I loved this book, but I really hope you'll make space on your shelves and reading lists for it - you won't regret. 1) Hi Melanie! It's a great pleasure to have you stopping by Bookish today! Huge congratulations on your new release, Audacity! How would you describe it to those who haven't heard of it yet? 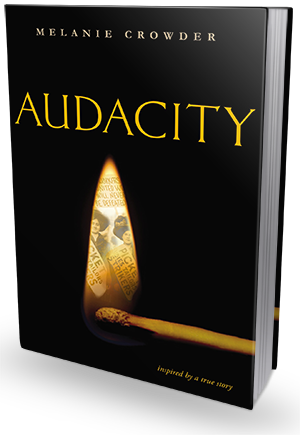 Audacity is inspired by the real-life story of Clara Lemlich, a spirited young woman who emigrated from Russia to New York at the turn of the twentieth century and fought tenaciously for equal rights. Bucking the norms of both her traditional Jewish family and societal conventions, Clara refuses to accept substandard working conditions in the factories on Manhattan's Lower East Side. For years, Clara devotes herself to the labor fight, speaking up for those who suffer in silence. In time, Clara convinces the women in the factories to strike, organize, and unionize, culminating in the famous Uprising of the 20,000, the largest strike by women in American history. 2) Who or what inspired you to write Audacity? Well, Clara inspired me! But I found her in sort of a roundabout way. If you haven’t seen the movie Iron Jawed Angels, drop everything and go watch it. So I saw this movie (and cried the ugly tears that I do when I encounter the stories of women who sacrificed so much for the dream of equal rights.) Skip a few years down the road, and I’m in grad school, trying to push myself outside of my comfort zone. I’m thinking I’ll try my hand at a picture book biography—little did I know this idea would turn into a full novel, and in verse, no less! Anyway, I began combing through biographies of suffragists: Alice Paul, Lucy Burns, Inez Milholland, and I discovered the role of immigrant women in the suffrage movement in this country. There, I found Clara. She was so impassioned, so committed—her story simply wouldn’t let me go. 3) What made you choose a verse form of the narrative for your book? Clara was not a color-in-the-lines kind of person, so traditional prose never really seemed to fit her. But more than that, she was a visionary and a dreamer. There is so much possibility in free verse for elevated language and rich imagery—I quickly discovered it was the perfect fit for her. 4) What were the challenges in bringing this story to life? Did you have to do any research for your book? Oh, my goodness, so much research! Not only did I spend hours and hours scouring nonfiction texts and articles, my research included visiting the National Archive, scrolling through microfilm, interviewing family members and listening to audio recordings. I even flew across the country to visit a labor history library and to walk in Clara’s footsteps through Manhattan’s Lower East Side. Audacity is fiction inspired by a real person, so my biggest challenge was in reading between the lines of the historical documents and finding the real person there, so much so that I could imagine her thoughts, dreams, and emotions. 5) Is there a message in your novel that you want readers to grasp? I want young readers to be inspired by Clara’s story. I want them to close the book believing that they, too, can change the world. Let’s see…I was obsessed with fantasy as a teenager, and would still read a grocery list written by Robin McKinley. My favorite verse novel is Home of the Brave by Katherine Applegate. I reread Ash by Malinda Lo at least once a year. Recently, I fell in love with Aristotle & Dante Discover the Secrets of the Universe by Benjamin Alire Saenz. 7) What are some of your New Year's resolutions? • Go to at least one writer’s retreat. • Dip my toes in the ocean. • Climb to the top of a mountain. 8) What books are on your January TBR pile? 9) Last question! I'm super curious and I'm sure your fans are all wondering about it too: are you working on your next book yet? If so, when can we expect it? Can you share some details to keep our appetites going? Actually, right now, I’m working on my next, next book. My next book is a middle grade story about a girl seeking a cure for her sister's mysterious illness in a world where water sprites play havoc with the land around them, and magic lurks just out of sight. It’s called A Nearer Moon, and it’s coming out this fall!